Watch the DIY Literacy webinar! Couldn't make Kate and Maggie's webinar? Or wish the hour hadn't gone by so fast? No problem! We recorded it so that everyone has a chance to watch or re-watch any time. 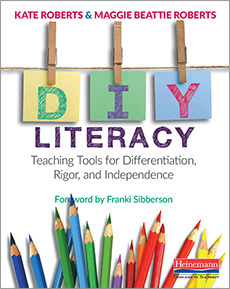 Don't forget to use #DIYLiteracy to discuss what you see with the Twitter teaching community and with @teachkate and @MaggieBRoberts and also check out examples of learning tools created by your colleagues around the country and their students.